Bubble football is the brand new sports to enjoy your incredible weekends, holidays, parties or events with thrill and spills in Toronto city. 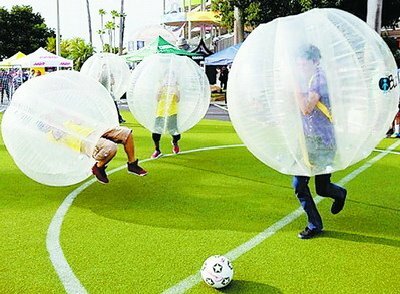 Bubble football is a combination of playing football with an enormous 1.6m diameter zorb balls wrapped from head to waist with only players legs free to move. Bubble football is played as a team game with the objective of scoring more goals than the opposing team. Players try to collide with one another meaning any efforts to actually play football bring hilarious results thus it is called "Bumper ball" or "Bubble football”. Bubble football can be played on a football pitch, open and clear grass fields and also indoor sports hall. It is completely safe and doesn't hurt when you hit the ground. Bubble football can be enjoyed by all ages and you'll laugh yourself silly and have a great time playing this craziest sport with your colleagues, friends and family. No hard rules to play this crazy sports where teams compete to score goals without ever being allowed to touch the ball with their hands. So take part or just watch as players bump into each other losing their balance and falling over each other trying to show off their football skills. We are associated in arranging your own personal event or games and if you are planning an event in your local community, contact us and we will bring this brand new sports to your place. For Holleyweb bubble football suits and bubble football equipment, we are on sale. Please click here to get the big discount!